Shalana Little’s arrest for “Lynching” is an outrage. She stands trial in June – Take action now! On December 19, 2014, the Los Angeles Police Department arrested Shalana Little, an activist in the Ferguson solidarity movement in LA, on the outrageous charge of felony “lynching”, following the aggressive tactics of the police to disrupt a march in Hollywood. She was severely mistreated during her arrest, was held on $30,000 bail for four days, and finally released on Christmas eve. Although the lynching charge has been dropped against her, she faces the possibility of years in prison on the remaining charges. Shalana is not the only Californian activist facing charges that paint protesters as violent agitators. 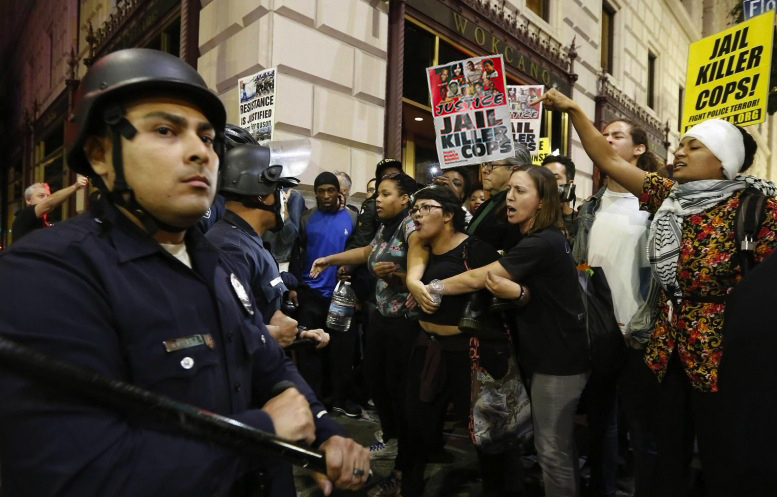 Over 400 people have been arrested in recent months during mass protests against police brutality in Los Angeles, but Shalana and a few others are facing some of the most serious charges. Xaime Casillas stands trial this Monday – May 18 – for five counts of resisting arrest and one count of battery against an officer — crimes of which he is innocent. In Sacramento, Maile Hampton faced arraignment on a lynching charge, which was subsequently dropped to one count of resisting arrest last month. Using California’s lynching law against protesters is an outrage. First passed in 1933, the law was passed to prevent mobs from forcibly taking people from police custody in the name of vigilante justice. Yet, today, a law once won in large part by anti-racist activists is now being used to perpetuate police repression against those anti-racist activists fighting against police terror. These arrests and prosecutions are part of a national trend to target Black activists with more serious charges like “lynching,” while doing nothing to stop the true lynchers: the killer cops. But we are fighting back! Shalana is going to trial in late June. Xaime stands trial this Monday on May 18th. We won’t play their game any longer. We must pressure the prosecutor to drop all these charges now! 1) Click here to sign the petition demanding that the Los Angeles City Attorney Mike Feuer drop all charges against Shalana Little, Xaime Casillas, and all other protesters now. @Mike_Feuer @cityattorneyla Drop the charges against Shalana Little, Xaime Casillas and all who protest racist police killings NOW! Shalana Little (on right in cap) and Xaime Casillas (at center in suit and tie) with supporters in front of county courthouse in Los Angeles. When she was arrested, the LAPD falsely claimed that Shalana was guilty of obstructing justice and removing a person from police custody — “lynching” under California law. Shalana’s charges have since been reduced to three counts of resisting arrest and one count of failure to disperse. We should not, however, mistake these reductions as a ‘win’. 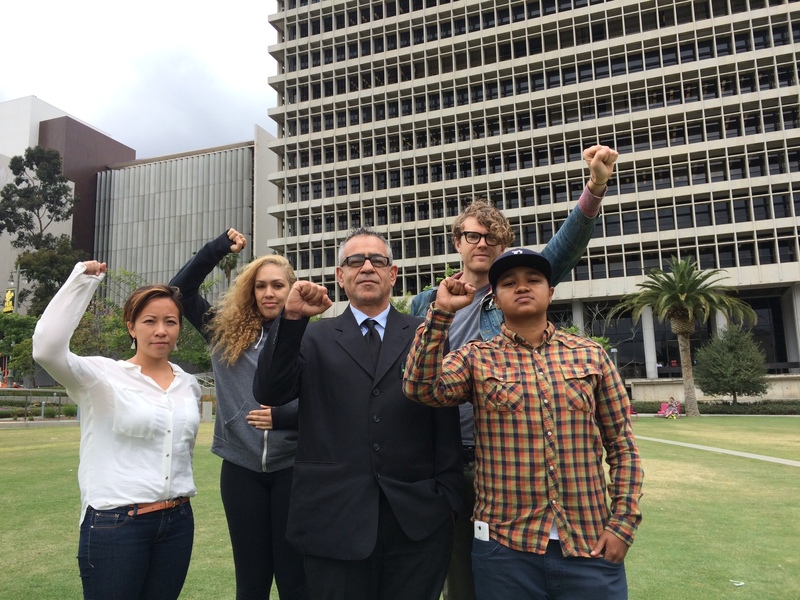 The reduction of charges is all part of a strategy pursued by the city attorney in close cooperation with the LAPD to appease the public: it lessens the possibility of an outcry against the LAPD’s racist arrest, while ensuring that activists of color continue to be prosecuted for their commitment to justice. Instead of dropping all charges–as the city attorney should have done–they have used the lynching charge and their decision to reduce the charges to pressure activists to take plea agreements while appearing to be “compassionate.” But nothing could be further from the truth: this racially loaded strategy of over-charging and subsequently dropping those charges is part of a carefully choreographed stunt to get us to stop fighting for justice for Shalana and all be happy she “only” has to spend four years in jail for defending Black lives. Lynching is what mobs of white racists committed against thousands of Black people in the United States. They took Black people from the custody of the police with the tacit consent of the cops and state. The mobs then beat, mutilated, tortured and hanged them. This ironic plot to charge an anti-racist Black protester with lynching screams arrogance on the part of the cops and the DA. The people see through these charges. We charge the state with lynching. We charge the state with attempting to lynch the Black Lives Matter Movement. In fact it is the police who are guilty of obstructing justice, in this case and historically. These charges against Shalana are in reality “revenge” charges against leading activists of the Black Lives Matter movement. We in the S.T.O.P. Brutality coalition, along with a wide network of endorsing organizations, are mobilizing to fight back against this police repression. The story that the police and city attorney present is entirely different from the facts of what actually happened. In reality, on the two nights that Shalana was arrested – Nov 26 and Dec 19 2014 – Black Lives Matter marches were disrupted by police who wanted to shut it down because of its political content. The police violated the protesters’ right to free speech and arrested several people. The police were the aggressors, not the activists. It is the police who are obstructing justice, not the protestors. Click here to sign the petition demanding that the Los Angeles City Attorney Mike Feuer drop all charges against Shalana Little now.